The Atlas Carrier was based upon an older modified MAC Hephastoi class transport. Originally built to transport massive loads to and from the Asteroid Belt, this class of ship was equipped with Mass Drivers capable of running off of cheap and plentiful iron nickel rubble eliminating the requirement to have hydrogen supplies transported from the gas giants. The Hephastoi class was able to sustain a large crew for an extended duration. This coupled with it's modular design, led to several variations in the design and a diverse array of usages. Most of the Hephastoi's primary systems, aside from the weapons control and fighter launch/retrieval systems, were carried over to the Atlas variant. Structural changes in the Atlas included upgraded hull armor and a reversed habitation section. Additional research has focused on attempts to modify the drivers for plasma acceleration for destinations in the outer solar system. 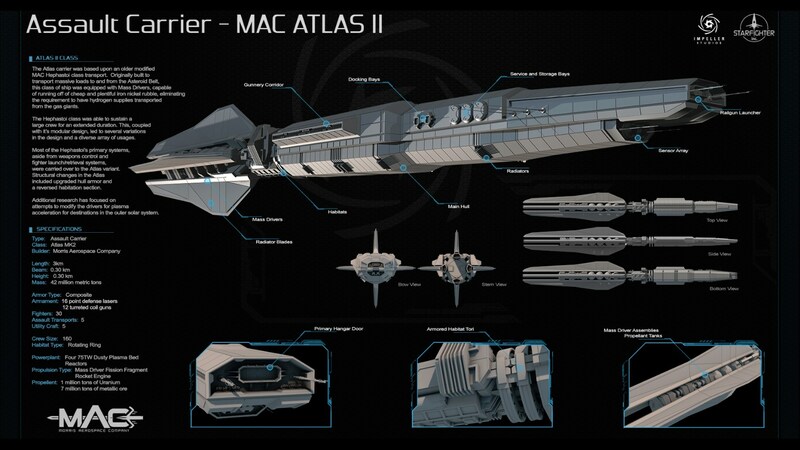 Stay tuned for more shots of the MAC Atlas II and other ships. I'm really liking the look of the carriers. They look like big, sophisticated spaceships, yet practical and tough. Nothing needs to be pretty, though I think this ship has its own charm to it. I'm curious what the "reversed habitation section" means? What did they have to do to that area to make it an Atlas variant? Thanks for giving me an opportunity to learn what a fission-fragment rocket is! As I said in the idea document, I like designs that specify coil-guns, instead of rail guns. I like the design, but am surprised by the size. Why does it need to be so big? And is one million tons of uranium really necessary? I mean, I haven't done the math (and maybe you have), but a few tons reacting at terrible efficiency can still power a large town for a decade. @Shrike: MAC is the manufacturer, that stands for Morris Aerospace Company. We’re considering changing the founder’s name, so don’t hold us to that. @Miek: Take out everything in front of the habitats (which is mostly hangar, service and gun bays, what makes the Atlas a military ship), and what you have is nearly a Hephastoi. Thing is, the remaining module in front of the mass drivers is reversed in the latter ship, so the habitats are directly against the mass drivers. This way they’re not the first things impacted in a collision. In an Atlas, to scram the reactor it can dump the whole mass driver section, in which case the Hephastoi configuration would lead to the same problem – the habitats would be exposed – so it was swapped around. @AidanofVT: The original Atlas was formed to test the limits of the game engine and was an incredible 12 kilometers long. It was so big it was giving our artists trouble, and not only dwarfed many of our locations, but outmassed some of them, so we took the ax and made it more reasonable. That being said, we still wanted it to be the biggest ship in the game by far, so it’s about as big as it can be. There is some math behind it – the mass drivers are long enough that with acceleration close to 200000 G (peak acceleration of a bullet in good gun), a projectile leaves at around 80 km/s. That high velocity translates to good specific impulse competitive with most of our high thrust nuclear engines, and hence great fuel efficiency (you’re getting a lot of momentum transfer out of a small mass). Now as for the million tons of uranium… before I show you the math, I should point out that spaceship drives need a LOT of power. The Saturn V massed 2290 tons at liftoff and its first stage developed an average power of 190 GW – that’s half of what the whole EU is using and a third the US – and it burned through that in less than three minutes. The Atlas is 18340 times more massive and is meant for year-long voyages, so it needs a vastly greater energy store. But there is a reason for this particular figure besides convenience, and that boils down to the Tsiolkovsky rocket equation, Delta-V = Exhaust Velocity x ln(mass ratio) (in case anyone’s wondering, delta-v is a term that describes how much we can change spaceship speed, which is essential for reaching different orbits, and mass ratio is the ratio of the ship when fuelled to when it’s empty). The fission fragment rocket engine has incredibly high exhaust velocity (5170 km/s according to Werka’s figure), so out of these million tons of uranium (which puts the mass ratio at 50/49 = 1.02) you get delta-v of 102 km/s. This is well beyond what any Hohmann transfer requires (barring the interplanetary transport network, it’s the least demanding way to get anywhere), so the Atlas could get anywhere in the solar system and has plenty of fuel left for extra trips. More importantly, it allows it to boost more than strictly necessary to reach its destination quicker: using only Hohmann transfers to get to low Saturn orbit and back would take 12 years, but the Atlas can do it in 2. It’s expensive, but the military is willing to bear it to get there relatively quickly. I guess the size makes sense in terms of how long deployments are. Modern aircraft carriers typically go for a matter of months without resupply. To go years, it would have to be much larger. would this carrier be in line with a Battlestar? No. Battlestars have hyperdrives, and so are largely composed of useful space. The Atlas has no fictional technologies, and so is mostly composed of propulsion accouterments and supplies. Shh shh shh, it's okay. ... so no alien robot space dogs?